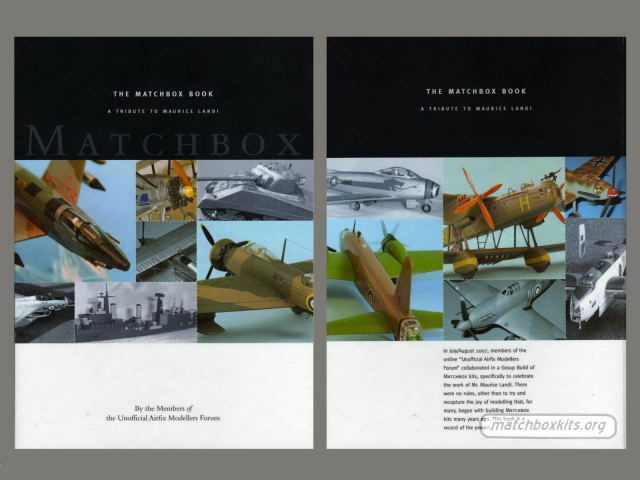 In July/August 2007, members of the Unofficial Airfix Modellers Forum collaborated in a Group Build of Matchbox kits, specifically to celebrate the work of Mr. Maurice Landi. There were no rules, other than to try and recapture the joy of modelling that, for many, began with building Matchbox kits many years ago. This book is a record of the project. front and back cover of the Matchbox tribute book. the members of the Classic British Kits SIG (special interest group) handing over the first tribute book to Ted Taylor, a colleague and friend of Maurice Landi. a picture of a built Buccaneer, one of the subjects shown in the book.